Hey everyone! It's Anna from Hanging with Mrs. Hulsey! The school year is officially in full swing-- and my students are definitely feeling more comfortable with me and each other! One thing I've decided we need to focus on more is our classroom community! Here are some quick ideas to help you promote a positive climate in your classroom! Time is precious in my classroom because we departmentalize. It feels like we are always on the go. However, I feel that even something as small as a weekly morning meeting would help my students develop a more positive feeling toward one another. You can read more about morning meetings for older elementary students here! I also love this product from TPT! 1 Thing Wednesday-- name one thing we've done this year that you'd like to do again! I Think I Can Thursday-- what is one goal you want to achieve this year? Flashback Friday-- what is one new thing you have learned this week? What is your favorite book you've read this year? Thankful Thursday-- what is 1 thing you are thankful for? 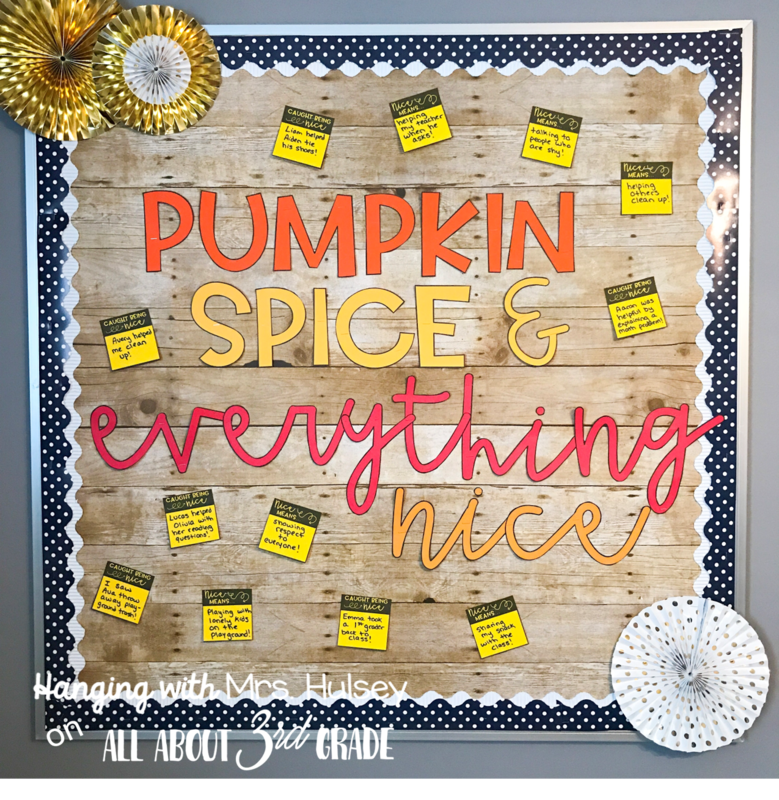 This activity would pair well with morning meetings! You and the students sit in a circle with everyone's legs out straight. Begin the compliment circle by giving a compliment to someone. Once someone has been complimented they cross their legs. Compliments continue until everyone has received 1. I think this is a great way to encourage students to see each other in different ways! 1. Print out the letters and hang on a wall or bulletin board. 2. Print the "caught being kind" strips on various colors of paper (I used Astrobright paper). 3. Cut the strips apart and keep on hand for when students catch others being kind. 4. When students experience a kindness or act of friendship, they come and ask you for a "caught being kind" strip. They write down their experience. 5. Start a paper chain and add a new link every time someone catches others being kind! You can find this freebie HERE in my TPT store! You can find these fall themed board HERE in my store! I hope you found these ideas to be useful to implement in your classroom! If you have any questions-- feel free to leave them in the comment section! Interesting craft. I really liked your work. Great ideas. I usually find interesting ideas from your blog. Keep sharing more. Thanks for the share.